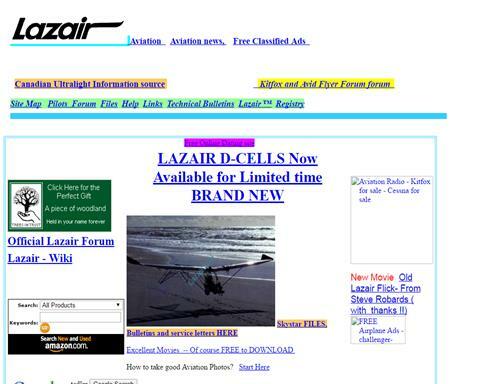 Lazair, The twin engine ultralight. 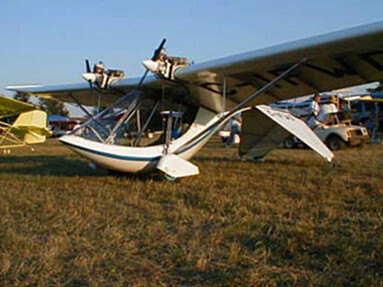 The tail is an inverted V which meant a reduction in drag over conventional 3 appendage tail ,they also double as the rear landing gear structure. 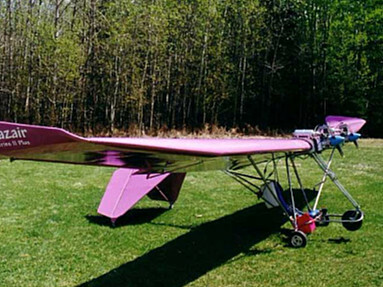 The Lazair was designed and built in Canada around 1979 there was 3 series that were manufactured as kits only, each series a modification of minor improvement to the next. 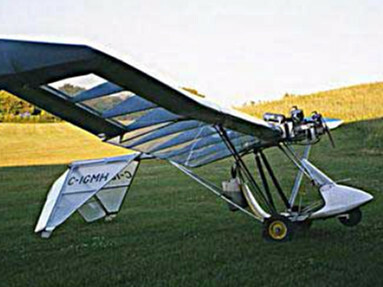 Series lll saw a change to landing gear they where widened for better ground handling also the control stick was mounted on the floor in the more conventional manner, jury struts where installed to increase the negative g loading. And toe brakes were includes as standard equipment. the Rotax engines were adopted from a portable high pressure water pump used in firefighting all parts are still available for these engines from firefighting equipment suppliers,(just don't say there for an airplane) that can scare some companies and may refuse to sell to you for fear of law suits. 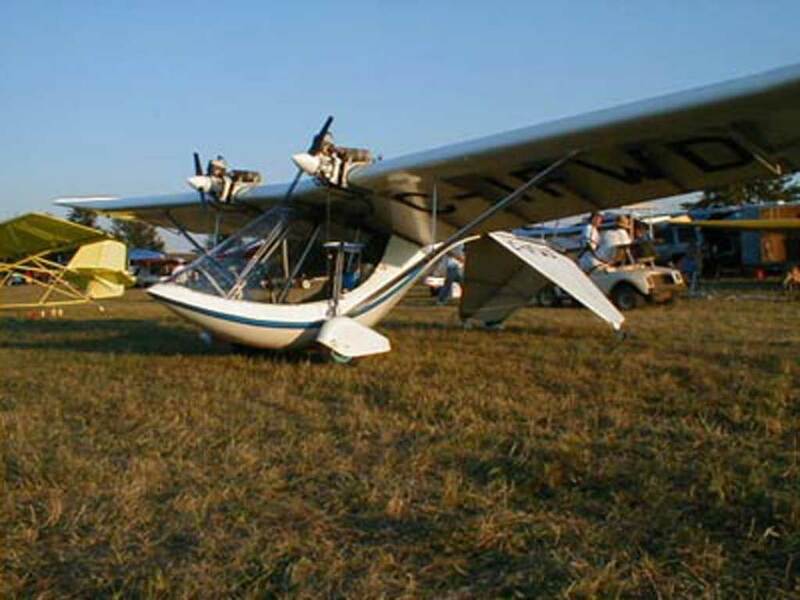 One of the most common questions I get asked about my Lazair is" Why does it have double props" No it wasn't some new technology to increase efficiency, not performance anyway ,it was purely a decision based on economics ,They already had a good stock of carbon fibre props for the 5.5 hp and instead of going thru a costly process of acquiring new propellers they simply doubled up the smaller props to absorb the extra power that the Rotaxs would produce .I'am also inclined to think that their choice of the rotax 185 somewhat based on this abundant supply of small props, seeing that the solo 210 engine was already in good supply, it was lighter, produced more power and was aircraft proven already, but they would have probably had to stick 3 or more props together, highly impractical. anyway probably a shrewd decision at the time. 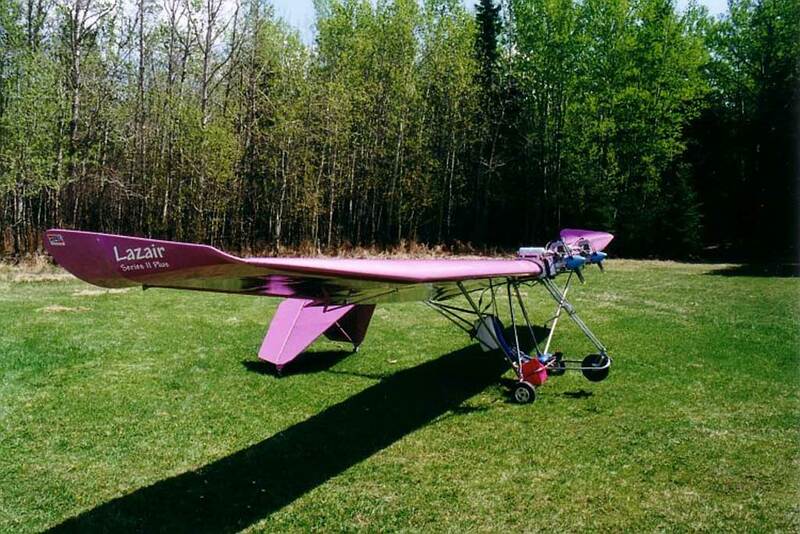 The Lazair is a absolute pleasure to fly, it is perfect for that low and slow journey over the country side,it is versatile, it can be fitted with skis or floats. 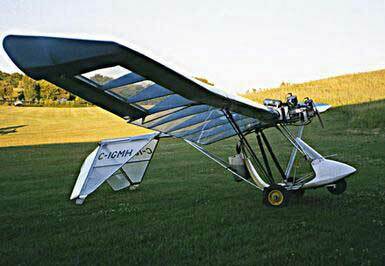 The aircraft is very well designed and constructed (by some guy by the name of Dale Kramer, god knows where he is today) , some of these ships are approaching 20 years old and they are still in great shape with a little tlc and as long as properly trained pilots fly them , they could last well into the 21 century. They also enjoy an unprecedented safety record, the few fatalities that I could find on the TSB and NTSB where attributed solely on pilot error.